Congratulations to Our IGA-Hellmann’s® Big Game Recipe Contest Finalists! As IGA’s only foodservice partner, Unilever Food Solutions’ specialized team working in deli and prepared foods is here to provide culinary and marketing resources to help grow your business, including exciting promotions that spark—and reward—your creative approaches to food solutions. 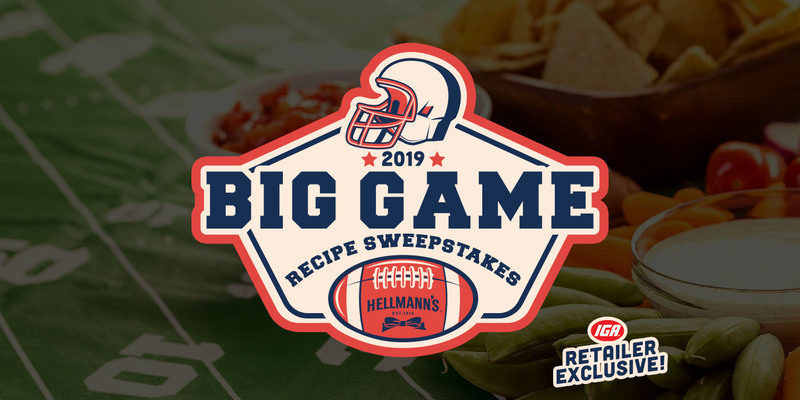 With that in mind, today I’m so pleased to announce the finalists in our first-ever promotion just for IGA chefs and deli teams—the IGA-Hellmann’s® Big Game Recipe Contest. IGA-Hellmann’s® Big Game Recipe Contest Finalists! On behalf of Hellmann’s and Bestfoods Mayonnaise, THANK YOU to all of the participants in the first-ever IGA-Hellmann’s/Bestfoods Big Game Recipe Contest! Three Winners will be named at the IGA Global Rally this Saturday, February 23, and will receive registration, hotel, and travel to the Culinary Institute of America (CIA) Menus of Change Summit in New York City’s Hyde Park this June 18 – 20, 2019! If you can’t make it to the Rally, tune in to our Facebook live stream around 12:45 p.m. PST to see who wins!